Matt collecting centipede eggs in Scotland. I recently had the opportunity to mercilessly bug Matt Benton for an interview about his experiences in science and his opinions on sciencecommunication. Matt is currently a PhD student at the University of Cambridge, Cambridge, UK and I was keen to pick his brains about a place that has a certain mythical, foggy aura of expectation and history surrounding it. Matt completed his undergraduate studies at the University of Otago in 2008, graduating with a first class honours degree in Genetics and walking away with the Ann Wylie Prize in Genetics and the Junior Smeaton Prestige Scholarship in Experimental Science, awarded during his years here. His honours research project was investigating the evolution of insect torso-like and was under the supervision of Associate Professor Peter Dearden and Dr Liz Duncan in the Laboratory for Evolution & Development. 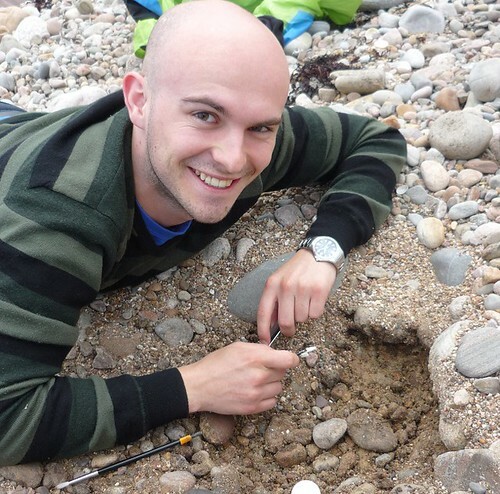 In 2009, Matt moved to Cambridge to take up his PhD studies on the early patterning of the germ anlage in a short germ insect and a myriapod, under the supervision of Professor Michael Akam in the Department of Zoology. Miscellaneous beautiful building at Cambridge University. He earned several awards and scholarships to fund his studies in the UK including the Cambridge International Scholarship (Cambridge Commonwealth Trusts), the John Stanley Gardiner Studentship (Department of Zoology), the CT Taylor Scholarship (University of Cambridge) and just to top things off he was awarded supplementary travel grants from Darwin College and the Department of Zoology. He is a member of Darwin College and is currently approaching the end of his first year of PhD research. 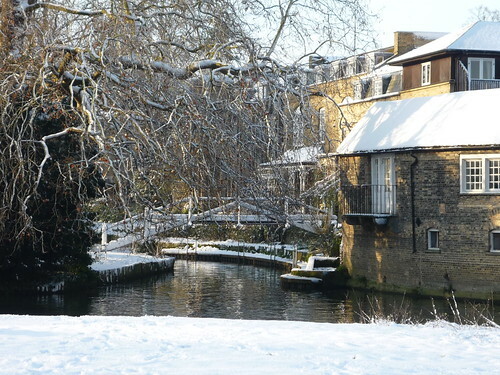 The rear of Darwin College, Cambridge, UK in winter. Obviously. Did you consider doing a PhD at Otago University? Why did you choose Cambridge? Do you think the generic assumption that ‘Cambridge on your CV=you’re a winner regardless of everything else’ is still true? Ever was? I think it is a definite boost for most careers, for good reason. It’s hard to get into, and there are many benefits of being here (as I discuss below). As for postdoc positions, it probably depends more on who your supervisor is and how much you publish than which university, but then funding bodies may like the Cambridge name. I would imagine it would help a lot when going to set up your own lab or going for lectureship positions etc. Is there a sense of power & entitlement present amongst the staff employed by and the students enrolled at the university as there is to be perceived by ‘outsiders’? Sometimes, with some people more than others. Some people can get very full of themselves but that isn’t just Cambridge, rather that’s just how some people are. Many of us remind ourselves that we are fortunate to be here. We worked hard to get here and now we get the benefits. But that’s largely to help with the stress and difficulty of actually being here. Is it actually hard to get in as an undergraduate? Yes, especially now. The economic situation is putting a squeeze on all universities here. Is the name and reputation of a place more or less important than its quality of teaching and research outputs? Can you have one without the other? Personal opinion: I think the name and reputation should be based on the teaching and research output, and for the most part Cambridge is true to that. Unfortunately some people see only the name, without also seeing that good work is being done here. I agree – do you think there is a degree of dismissal now, people hear the name and dismiss further discussion of the work? As opposed to a little known uni, where if someone is talking with you they then want to know your work because the uni itself is not a conversation point? I’m not too sure of this as I’ve only experienced it from the side of a Cambridge PhD student. If anything, I would think that people may pay more attention to the work of someone from a big uni. This may just be an example of how tough things are getting in science; some people may feel they only have time to network with people who are at a good uni/with a good supervisor. Personally, I think this is crap but that could be my NZ upbringing and the fact that I know there’s some top notch research going on at less well known universities, such as Otago. Do you think having done a PhD at Cambridge will give you a leg-up in the world? 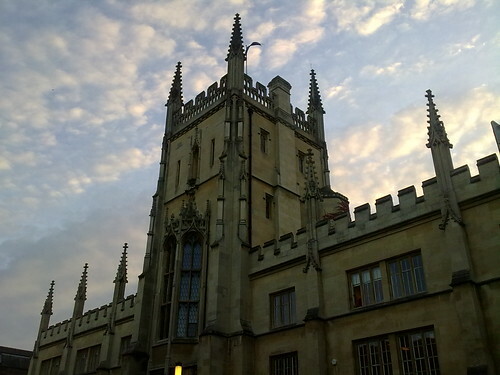 Did you receive much of a culture shock moving from Otago Uni/NZ to Cambridge/UK? Yes, a major one. So far it has taken months to adjust, and I’m still adjusting. Hardest thing to get used to? The culture of Cambridge and of Britain as a whole. In general kiwis are much more positive with the ‘can do’ attitude. Everyone says that but it’s still a surprise how prominent it is. Do you think communication of science to the public is important? Yes, but I think we need to be very, very careful about the people who are communicating to the public and the avenues they are using. There are countless examples of how the media have twisted the words of a ‘scientist’ and caused public panic. But sometimes both scientists AND the media are to blame for this. I think those scientists that want to communicate with the public should learn how to. Who they can learn from etc, I don’t know,. As for touchy subjects such as GE, I think that an understandable explanation to the public should be presented with governmental policies to introduce new things to the public. There will always be people who have problems with something that’s being done. The trick is to educate people from our side so the people with the problems don’t have all the say. As for the science behind a disease [with regards to doctors fully informing patients of the nature of their disorders], I think this is unfeasible as doctors (GPs) are meant to be a jack of all trades. Even specialists probably don’t keep up on the latest literature. If the person wants to know more there should be sources for them to find out more. Although this can lead to… awkward situations: I heard a story from a doctor who was trying to explain a genetic disorder to a patient, and the gene name was sonic-hedgehog. Possibly a good reason for vertebrate geneticists to use boring gene names and leave the fun names to us with our invertebrates! Lastly, about kids [and scientists talking about their own work with them], how do you explain genetics to a kid that doesn’t know what a cell is? There is much to be said for kids to be taught about science but it has to be in a simplified and understandable way. Do you think communication of *your* science to the public is important? Because it is your work, or because the public would benefit from knowing about it? Yes, both. My work is based in a field that is trying to answer fundamental questions. Through the discoveries of evolution and development it was initially found how similar the development of vastly different organisms can be. Now we’re finding out how bloody different the development of similar organisms can be, and my work is a part of this. Do you notice a difference in how science is ‘run’ in the UK to the way it is run in NZ? For example, as a general opinion: science is sidelined in NZ, and not a career of choice – funding reflects this. Generally do you find science the same in UK as NZ? Importance/funding/attention given to it/media time etc. So far, I haven’t noticed any difference really. Science is more prominent here but that may just be because of more people, more funding, and more net research. As for the difference in pay scale, that’s worldwide and it might not so much reflect that science is sidelined. How things stand at the moment, people know that you don’t go into science for the money, and I think that’s good, people should be in it for the science! We work long hours, and don’t get paid as much as so many others that have had less training, but we get to spend our days doing our hobby! Science is often difficult and depressing, but at the end of the day it’s fun. If I had unlimited money, the thing I would spend most of my time doing is science. What about science communication to the public? UK vs. NZ? Maybe, there are more articles about science in the news here, but they’re often misrepresented, just as anywhere. Overall, I think the UK is probably further ahead in training science communicators. From what I’ve seen (anecdotally) a bit of both; this is both due to amateur communicators and to training programs. There are student-run science magazines from people who haven’t done lots of science communication. One of these people was an undergrad in my lab and she wants to do science journalism for communication to the public now. Are the universities run the same way? If not — what are the most major differences? I can only speak for Cambridge, and you can’t begin to compare it to Otago. For example, i learned last week that our chancellor is Prince Phillip, the Queen’s husband. That sorta thing pops up every so often. Ask me again in 30 years maybe. I suppose one very obvious difference (especially for undergrads) is the college thing, but colleges are only for 3 or 4 universities in UK (oxbridge and not sure where else). I’m not sure exactly how things work for undergrads but I know colleges have a lot to do with their education and their support and monitoring them. Colleges are more of a social and community focus for graduates. The student population here is mostly undergrad but I’m not sure of the proportions of scientists etc, my college is graduate only so I stay away from undergrads. Do you see the same groups/’types’ of people in research labs in the UK to the ones in NZ? So check this, we have a German, 2 Greeks, 1 Italian, 1 Czech, 1 Kiwi, and 2 Brits (one is the boss). From my experience, there is much more variation in nationalities here but I think that’s a factor of Europe. It’s much easier to travel around here. I asked my German lab mate and she said that some labs in Germany that she knows are mostly made up from Germans, so perhaps the attraction of Cambridge and our lab head brings more variety too. Do you think you would ever return to NZ to continue your research science? Yes, but for personal reasons. Do you have a Science Idol? Whom and why? Closest would be Hermann Muller. He made incredible advances in genetics through his entire life, while having major personal problems as well. When he got the Nobel prize he really deserved it rather than being the right person at the right time. Do you think scientists having increased public persona’s would give the younger generations inspiration/career drive? By nature, a good scientist must spend most of his time doing science and staying up to date with his field. To become better known would take so much time; something else would have to drop. Also, it depends what they do with it. Many scientists shouldn’t be put in front of the public, and some current figures ‘cough-dawkins-cough’ do more harm by alienating people than good. If scientists want to communicate with the public, AS SCIENTISTS, then they should speak about their science, not about religion and philosophy. If you could change one thing about how we teach our undergraduates in NZ, to make them/science courses better, what would it be? Can only speak for the genetics course I did, and I would suggest including a compulsory bioethics course. Most people know about genetics and will have questions, so as people who have at least a BSc in genetics, we need to be ready to face them in a good way. I’m not sure how useful more practicals would be. The hons/masters programs are better for that. When/if you join a research lab they’ll probably assume you don’t have any practical skills anyway, it’s better to double check that a person knows how to use/do something rather than letting them go ahead and make mistakes. Hard to say, but I hope to have my own lab and a family, probably in NZ. 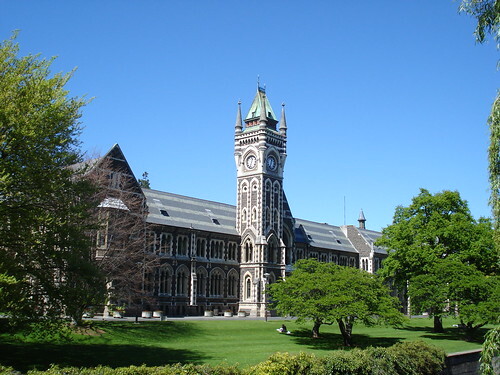 What is your general opinion of Dunedin and Otago Uni? Mostly good, but both need to have the more useless and dangerous buildings/people replaced. Generally outright amazing. But there are clouds for every silver lining. The clouds would be cultural things i.e. the problems with the recession here (every street in the centre of town has at least one empty shop in it) and the increasing squeeze on funding, the more uptight attitude of people (rather than the kiwi approach), the difficulty in finding a good coffee, the bloody tourists! Cambridge is hard to get in to (because of the funding etc), but it is worth the effort. The resources here (not just monetary based), the experience, plus being a part of Europe is a huge benefit. But it’s definitely not necessary to come here (or to any big uni) to have a stunning career or to do amazing science. I find the social stigma and conceptions (mis- or otherwise) surrounding the ‘Top Ten’ universities fascinating. It has become a measure of one’s intelligence — and a piece of information to casually drop in to a conversation so everyone you are speaking with knows just how awesome you are. I have nothing against the universities themselves (not even any jealousy — but the fact that some of you are thinking that reinforces my point exactly!) and admire the people with the commitment and drive to go the extra mile to meet the rigorous entrance criteria; but the present fact is that I have heard lecturers, past CEO’s of MoRST, current PhD students no longer there, – people of all description and level of ‘intelligence’ drop it in to conversation — and more oft than they aught. Sure, you went there — so did I. (Once, to use the bathroom — I love that line) but is it necessary to say ‘when I was in Cambridge’ every ten minutes during your Journal Club presentation on a completely unrelated topic?! Matt: AHHHHHH HAH! Here you go making the same assumption that people do about the big uni’s! You’re assuming that if someone gets into Nature they are ‘better’. How about if they’re actually just ok but have hopped onto the latest buzz? Nature publishes some absolute s***, misrepresented over-hyped s***, and you know it!. This is a good point — how about we consider my use of the words ‘Science’ and ‘Nature’ with regards to the journals — as metaphors for high-ranked journals in general? Continuing on — I honestly believe Matt Benton will have a brilliant scientific research career — but because he is Matt Benton, not because he is currently at Cambridge University. This rant is perhaps aimed at the wrong audience — I would like to think (and am sadly mistaken) that most of the science-grounded readership see my point as a given, Nature (etc) papers come from all over (now that would be an interesting statistic — what university/institution has the highest number of Science/Nature/etc publications historically?! Is it a subliminal/overt competition?!). And PhD’s are equally as hard (or even as easy) to obtain at Cambridge as anywhere else. It is the high demand and popularity factor that drives up the entry criteria that makes these places difficult to get accepted in to, and the perceived quality of the institution rises as a result. This muddy supply and demand topic is perhaps too thorny to get into now, but to present the linked factors — with such high demand and stricter entry standards, the real quality of your students and employees is going to rise along with it. So don’t think me dismissive of the high standard of such places, I just believe that the same high standard is also reached elsewhere — and dismissed just as quickly. A quack that once was at Oxbridge could more easily convince a group that the moon was flat simply because he has ‘Oxbridge’ on his CV. But the most important question is thus: would you be more likely to listen to the person saying ’Trust Me. I’m a Oxbridge Doctor’? Edited on 7/09/10 to remove a quote at the interviewee’s request.